Though soundcasting may be as fresh as a digital medium gets, its roots stretch back almost a century, to when radio broadcasting began. Included in those early days were broadcasts from an organization called the Los Angeles Breakfast Club, a group made up of Southern California business people, celebrities and just plain folks who got together every Wednesday morning to eat, network, and listen to guest speakers. Established in 1925, the LABC is still going (although it almost didn't make it) and is seeing resurgence in interest thanks to the efforts of new, younger members such as Board President Lily Holleman. She, in turn, got Phil Leirness involved in the club. The co-host and co-producer of the Chillpak Hollywood Hour (along with TV's Dean Haglund (The X-Files)), a soundcast that is in its 10th year, Leirness discovered an untapped treasure the deeper he looked into the LABC's rich history. That treasure was in the form of piles of audiotape, which was the moldering archive of what once was the Breakfast Club's weekly radio show. During the heydays of "old time radio", the LABC had a weekly show that featured its members and many guest speakers, a subject that was fascinating to Leirness who has been painstakingly digitizing and cleaning up the quality of tapes that, in some cases, were very likely on the verge of not being playable ever again. From the outset, and as he was trying to think of a way to help bring attention back to a long-standing Los Angeles institution, he was struck by the irony of re-broadcasting that original content once again. The premiere episode of The Los Angeles Breakfast Club: ON THE AIR, has launched as a special presentation of Leirness' Chillpak Hollywood Hour but will soon have its own feed as a monthly series. 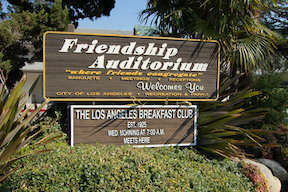 In the installment, Leirness lays out the concept of the LABC for the listener and a bit of its history, before playing some of the "found footage" recorded live at Friendship Auditorium ("the Shrine of Friendship") at the base of Griffith Park. The main feature of this kickoff is a visit to the club by President Calvin Coolidge in 1927, who addressed the club (and the radio audience) before sitting down to eat. There's also audio from various LABC members recorded in 1975, who recall Coolidge's visit. In this first hour there are plenty of interesting tidbits of footage, including a musical performance by a singer whose identity has been lost to time, and it's all curated by Leirness who clearly has a deep interest in this slice of Los Angeles history and culture. To bring things current with the Breakfast Club, he also talks to Holleman towards the end of the episode, who tells us about the current state of the club, mentions a slate of upcoming speakers, and encourages anyone either living or visiting in the Los Angeles area to drop by any Wednesday morning, bright and early at 7:00 AM, and experience the Los Angeles Breakfast Club for themselves.